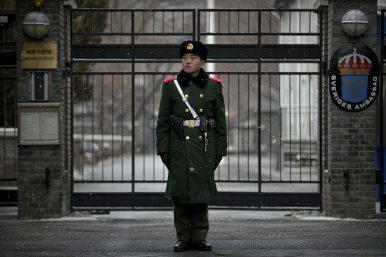 A paramilitary policeman stands guard at the gate of the Swedish Embassy in Beijing, Thursday, Feb. 14, 2019. Foreign citizens are increasingly being used to carry out the dirty work of the Chinese regime. Next to her was also Anna Lindstedt, the Swedish ambassador to China, trying to convince Angela to accept what she called “a new approach” from the intimidating businessmen. For having arranged this meeting, Lindstedt was called back from Beijing before her position was supposed to come to an end, and put under investigation by the Swedish Ministry of Foreign Affairs. Soon, the Swedish Security Service also started an investigation against Lindstedt for arbitrary conduct when negotiating with a foreign power. And last week, it was reported that Lindstedt is now under investigation for breaching national security. Neither the Ministry of Foreign Affairs nor Lindstedt are willing to comment due to the pending investigation. But Conny Cedermark, the lawyer appointed to Lindstedt by the Stockholm district court, says she is denying any crime and welcomes the investigation. Once the meeting and the threats toward Angela Gui became known in early February, the case draw some attention in international media. But some interesting background mechanisms went all but unnoticed outside of Sweden. The awkward meeting at Sheraton Hotel constitutes one of the most obvious examples of how the Chinese authorities are working to manipulate diplomats from other countries. Arguably even more important, the case also shows how China is increasingly using foreign citizens to carry out its dirty political work. One of the two businessmen — actually the one who issued the threats straight to Angela’s face — is not Chinese but a Sri Lankan citizen. His name is John Isaac Graham Meewella, and he was teaching as a professor at the business school of University of Oulu in Finland from 2010 to 2018. During this time, he also married a Finnish woman and had several children. But it was only after 2015 that Meewella’s career as a businessman also started to take off. That same year he first met with Kevin Liu, the second businessman attending the Sheraton Hotel meeting with Angela Gui. Since then, Meewella has started four companies in Finland, including MiniSV Nordic OY. In Sweden, there is also a company named MiniSV Sweden AB, where Meewella is president, CEO, and board member. This is relevant because the companies are offshoots from a Hong Kong registered holding company named Mini Silicon Valley — or MiniSV — run by Kevin Liu, with Meewella as its CEO. The two are also joint owners of a biotech company in the city of Nanjing, where Meewella has also been trusted to run other prestigious and ambitious projects. In an interview in the fall of 2017, on the website of Nanjing’s local government, Meewella claims that he has initiated cooperation with 20 Nordic companies in his role as head of Winnoc Sino-Europe World Innovation Center. Meewella was also awarded a special friendship medal by the city of Nanjing for his work. The innovation center is not only supported by a powerful Chinese state investment group. It is also connected to Nanjing Winnoc Technology Management, headed by Kevin Liu with Meewella as its president, CEO, and board member. Meewella is also CEO and board member of Winnoc AB, a branch company of Nanjing Winnoc Technology Management registered in Sweden. Nevertheless, the business connections give a hint of Meewella’s possible motives in confronting Angela Gui over her campaign for her father’s release from Chinese custody. Flattering foreign citizens with titles, positions, and other benefits is — as explained later in this text — an increasingly common strategy for the Chinese authorities to win over the loyalty of foreign citizens. And when the time is ripe to ask for political favors, the connections are already too deep to refuse. Kevin Liu, who first meet with Meewella in 2015, is often described as a flamboyant and well connected businessman. He is said to live a life of luxury and high importance, permanently renting a suite at Sheraton Hotel in Stockholm and constantly signing new business deals in various fields. But it has also been reported in Swedish media that Liu has run several of his companies and business ventures into bankruptcy. A quick search in Chinese online databases shows that Liu at the moment is involved as owner in at least 59 different companies. At any rate, Liu is known for his wide net of personal contacts, including both Swedish and Chinese ambassadors as well as reportedly individuals much higher up in the Chinese political hierarchy. It is not clear when Liu first meet with former Ambassador Anna Lindstedt. But it is obvious that they had a close relationship. In January, just one day before Lindstedt contacted Angela Gui to set up the Sheraton Hotel meeting, she attended the wedding of one of Kevin Liu’s sons in Nanjing. John Meewella was also there, making it likely that the idea of meeting was discussed at some point. 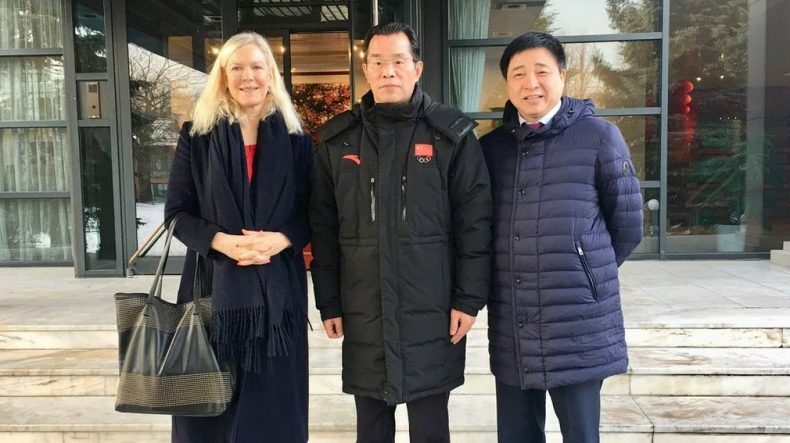 And the very same weekend as the actual meeting took place, Liu accompanied Lindstedt and Meewella to the Chinese embassy in Stockholm, for a lunch meeting with its notorious Ambassador Gui Congyou. Later that weekend, photos of Meewella and Liu together with Gui Congyou were shown to Angela as proof that the businessmen were talking to her on the behalf of the Chinese embassy. This photo, taken the same weekend as the Sheraton Hotel meeting, shows Lindstedt, left, with Liu, right, and Chinese Ambassador to Sweden Gui Congyou. While it is not yet clear what personal benefit, if any, Lindstedt had in setting up the meeting where Angela Gui was threatened, it is obvious that titles and money are increasingly used as tools to expand the Chinese Communist Party’s influence abroad. Under the presidency of Xi Jinping, a longstanding CCP organization called the United Front Work Department (UFWD) has been considerably revitalized. Its task is, simply put, to ensure the loyalty of everyone and everything that does not already belong to the Communist Party. As early as 2014, Xi branded the organization “a magic weapon” in the quest to rejuvenate the Chinese nation. That is hardly a surprise, given that a third of UFWD’s nine bureaus have an outspoken focus on spreading the Party’s propaganda and political messages abroad. The process includes cultivating Chinese businessmen abroad — just like Kevin Liu — to spread a positive picture of the CCP and if possible also carry out its policies. There is no lack of evidence of the UFWD’s increased overseas activities. A little more than a year ago, Australian Senator Sam Dastyari had to leave his position after it became known that he had been receiving donations from Chinese businessman Huang Xiangmo. The scandal was revealed after Dastyari defended the Chinese territorial claims in the South China Sea. In February this year, Australia moved to deny Huang’s bid for Australian citizenship and revoked his permanent residency, banning him from entering Australia again. “Political interference” was cited as a reason; Huang had donated millions of dollars in total to different Australian politicians. The Australian Security Intelligence Organization had been able to prove that Huang was head or member of several groups run by the UFWD. Well-connected businessmen like Kevin Liu would hardly run in and out of the Chinese embassy in Stockholm without the CCP expecting something in return. And dampening the criticism regarding China’s treatment of Gui Minhai is one of the most important objects of the Chinese ambassador to Sweden. By connecting the dots, it is not hard to understand why Liu was working with Lindstedt to achieve this aim. Indeed, ambassadors seems to be a particularly common target for China’s influence operations. In January, John McCallum, Canada’s ambassador to China, was fired after having suggested to media that Huawei executive Meng Wanzhou should be released. McCallum was reportedly under Chinese influence. And Mikael Lindström, Sweden’s ambassador to China from 2006 to 2010, is today working as an adviser for the controversial Chinese telecom company Huawei, which is currently bidding for the expansion of Sweden’s 5G network. This in turn goes hand in hand with “elite capture”: an increasingly common trend where influential politicians, businessmen, or academics are offered lucrative jobs and positions by the Chinese government, with defending the Communist Party’s political views as one of the most important tasks. The most striking example of this might be Bob Carr, Australia’s former foreign minister now heading the think thank Australia-China Relations Institute, founded by the above-mentioned Huang Xiangmo and funded by a range of other actors from or closely affiliated with the Communist Party. Other Swedish citizens were involved in the Sheraton Hotel meeting debacle too. Most notably Niclas Adler, a well-known entrepreneur, who was the one to first introduce Kevin Liu to John Meewella. During the Sheraton Hotel meeting, Liu referred to Adler as “my man in Sweden.” Adler also called Meewella during the meeting, instructing him to hand over the phone to Lindstedt. A post from Meewalla’s Twitter account shows him, Lindstedt, Liu, and Adler together. Again, the pattern of trading business favors for political favors can be sensed. Adler’s connection with Liu goes back to 2010, when Adler was director at Jönköping International Business School, where Liu’s children were studying. Together, the two launched an initiative to attract more Chinese students to the school. Among the numerous business ventures that Adler has been or is currently engaged in, he is the chairman of Nordic Growth Technology Partners. The company is a subsidiary of Accelerated Innovation Group Limited, where Meewella, according to his now scrubbed CV, is CEO. Accelerated Innovation Group also has connections to Liu. In the fall of 2017, Nordic Growth Technology Partners, together with a state-owned institution named Shenzhen Investment Holding Company, established a joint investment and innovation fund investment fund worth 10 billion renminibi. In photos from the inauguration ceremony in Shenzhen, Fredrik Reinfeldt, Swedish prime minister from 2006 to 2014, can be seen applauding in the background. It is not entirely clear what the fund has been investing in so far. 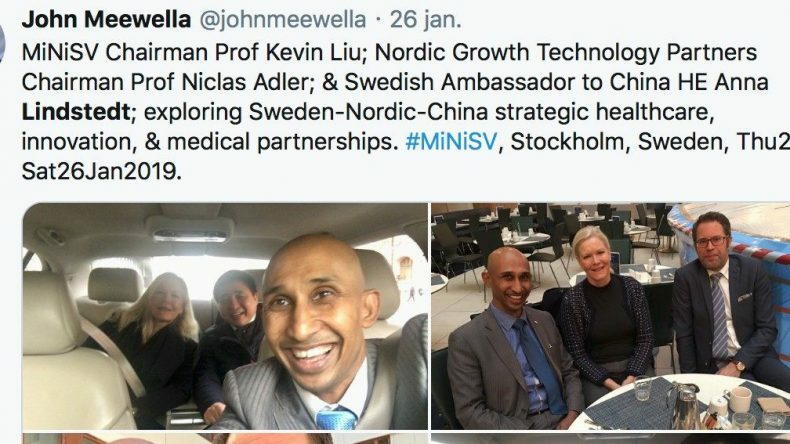 But merely serving as head of a large Chinese fund with the former Swedish prime minister on the payroll as an adviser is of course brilliant exposure for an entrepreneur like Adler. And it could make him inclined to be grateful toward Kevin Liu and other involved domestic actors. But what the Chinese authorities have really succeeded in doing is using foreign citizens to manipulate the Swedish ambassador into assisting the effort to threaten family members of a kidnapped Swedish publisher into silence. Jojje Olsson is a journalist and author living in Asia since 2007. He is currently based in Taipei. Detained activists have two choices: vanish or confess.